A Gorgeous New Design for the 2018 Britannia! Over 2,000 years ago, when the Romans first landed on the shores of a massive island beyond the northernmost reaches of their empire, they named the discovered land Britannia. Over the years, the title of Britannia bloomed into a lyrical personification of the isles that evolved from the conquered figure imagined under Emperor Hadrian to the "warrior queen" of the Elizabethan era and beyond. And while the United Kingdom continues to change and evolve, the figure of Britannia still stands tall, illuminating the ideals of pride, fortitude and progress. Britannia's beauty and symbolism has graced British coins for centuries. So, it was only natural for her to take center stage when the British Royal Mint introduced their premier gold bullion series in 1987. Bringing silver into the fold in 1997, today the Britannia is among the most premier names in precious metal coinage, standing with the South African Krugerrand, the American Eagle and the Canadian Maple Leaf. And while the bullion edition of the Britannia has kept its same design since 2013, each year brings an exciting new design to the Britannia Proof -- and this year is no different! 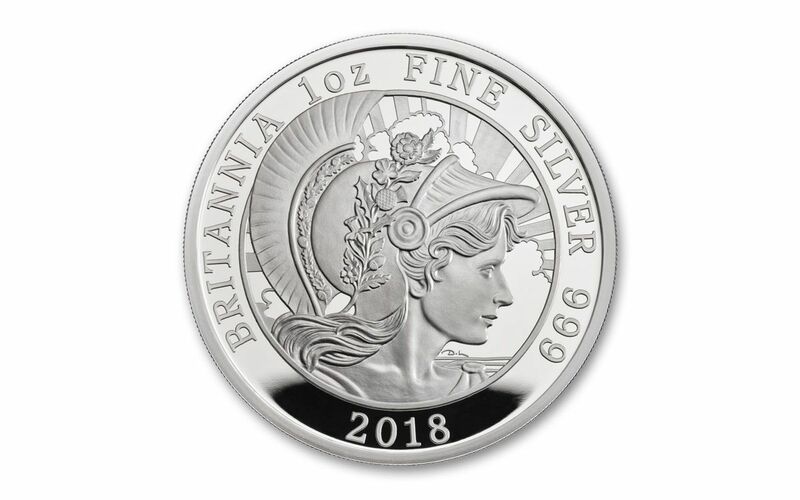 With a new contemporary design by one of England's rising young artists, we're proud to bring you the 2018 One-Ounce Silver Britannia Proof! Struck in one ounce of highly-pure 99.9% fine silver by the artisans of the Royal Mint, this legal-tender £2 (two pounds) coin also comes in gorgeous Proof condition exhibiting superb details and a beautiful, lustrous finish! And with only 7,150 proofs for worldwide release, you’ll need to act fast to guarantee you get your Silver Britannia Proof! 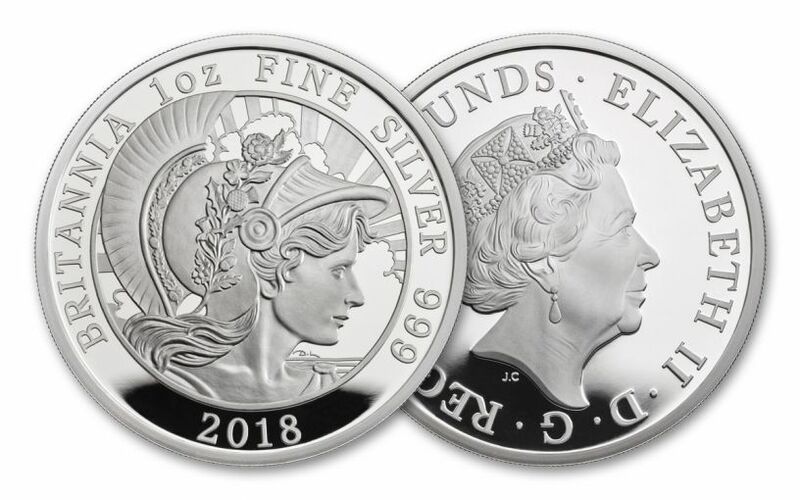 Like the others that came before it, this 2018 Silver Britannia Proof both establishes and reimagines an enduring symbol of British strength. Whether you're new to the Britannia series or a longtime collector, coin fanatic or Anglophile, this vision is one worth bringing home. Don't miss this opportunity -- order yours today! MAGNIFICENT MODERN DESIGN -- Standing steadfast in her defense of the British Isles, Britannia is the embodiment of Great Britain. She is featured on the coin’s reverse wearing a helmet adorned with flowers as designed by acclaimed British artist and designer David Lawrence. 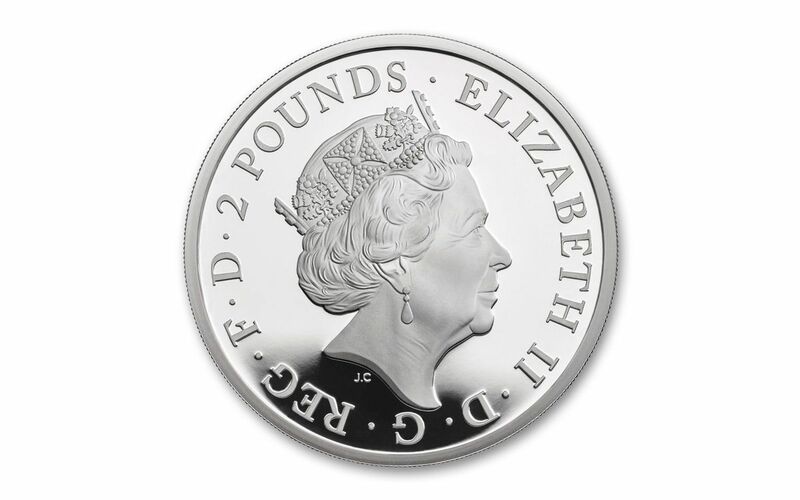 The coin’s obverse depicts Her Majesty Queen Elizabeth II. PROOF-STRUCK IN HIGHLY PURE SILVER -- The artisans at the Royal Mint use hand-selected planchets, polished dies and multiple strikes to create this gorgeous one-ounce, 99.9% fine silver piece of numismatic art. UK LEGAL TENDER – The 2018 Great Britain One-Ounce Silver Britannia Proof is £2 (two pounds) legal tender in the United Kingdom. GRADED IN GORGEOUS PROOF CONDITION – Your 2018 Great Britain One-Ounce Silver Britannia Proof will come in gorgeous Proof condition, meaning it was expertly crafted by the mint from hand-selected planchets, polished dies and multiple strikes to produce beautifully frosted details rising over mirror-like fields! A LIMITED-MINTAGE EVENT -- The Royal Mint will strike only 7,150 of these Britannia Proofs for collectors worldwide. Not only that, but this intricate design will only be minted for this 2018 series. Once they're gone, they're gone for good!